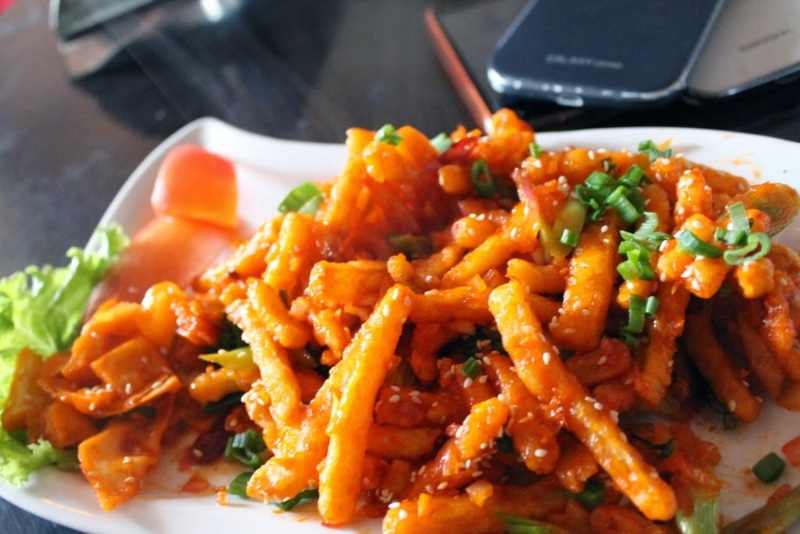 Chilli potato is crispy and most likely Chinese dish which everyone like.You can enjoy it with sauce or rice or noodles also.It is very crispy dish filled with snacks.There are few easy steps to make dish crispy chilli potato.I hope you will like it. Potato skins wash with water and then cut to pieces in the size of their finger. Hold these pieces in any bowl and mix a salt, black pepper and cornflour in this. Heat a oil in a pan and deep fry potatoes and put them into a bowl. Now take another pan add oil in it, when the oil is hot then add a onion(chopped), garlic ginger paste into it. When it get light brown then add a tomato(meshed) into it. After 15 min put vinegar. red chilli powder and soya sauce into it. Mix them properly and then add fried potatoes in this. After 10-15 min take off from fire pan. Hold it into bowl and garnish it with finely chopped coriander and serve it with chilli sauce or tomato sauce.